Tiger sightings in any national park of India have fluctuating cycles. There are times when multiple tigresses start breeding cubs and as a result sightings flourish as the summers approach. As the cubs grow up and start forming their own territories and females become solitary again & there is a brief dip period and the situation takes some time to normalize. It was during this season of dipping summer sightings when I along with my friend Gautam Pandey visited Bandhavgarh National Park in the warm summer months of 2011. The tiger dynamics of the park were not very encouraging at that point of time as none of current cubs were around and queen Vijaya was still trying to find her ground in the Chakradhara meadows. As we started our first drive in what was going to be a marathon run inside Bandhavgarh, little did we know that our tiger luck would be at abysmal levels in the days to come. After a few days of dry dusty drives, clouds of negativities surrounded us and we were just waiting to wrap up the shoot as soon as possible. The heat made us ignore a basic thumb rule – when with nature, it is imperative to be positive and absorb nature in all its forms and shapes. Our 6th day started in a rejuvenating fashion as we stuck to some basics. Something was good about that morning as we started with no pre-defined strategies. In an unusual relaxed fashion we started a bit late and despite of the deliberated 15-20 minutes delay we were the first vehicle to enter the park gate. For a change the desperate cat-seeking prayers transformed into a mere ‘thank you’ to mother nature for making us experience this wonderful forest. The sunrise over Ghodademon was refreshing and the rocky patterns on the upper reaches of the fort dazzled in morning light. The soft chirps of bush birds were live music to the ears at the vehicle sped leisurely across a forest buzzing with cheetals and langurs busy in their morning chores. Our days of disappointments were in the back-burner and the beauty of nature was touching our souls. As we moved towards Mirchiani, a sudden movement across the stoned parked boundary attracted our attention. As soon as we breaked, a huge black ball of hair emerged out of the wall peeping right into the vehicle. 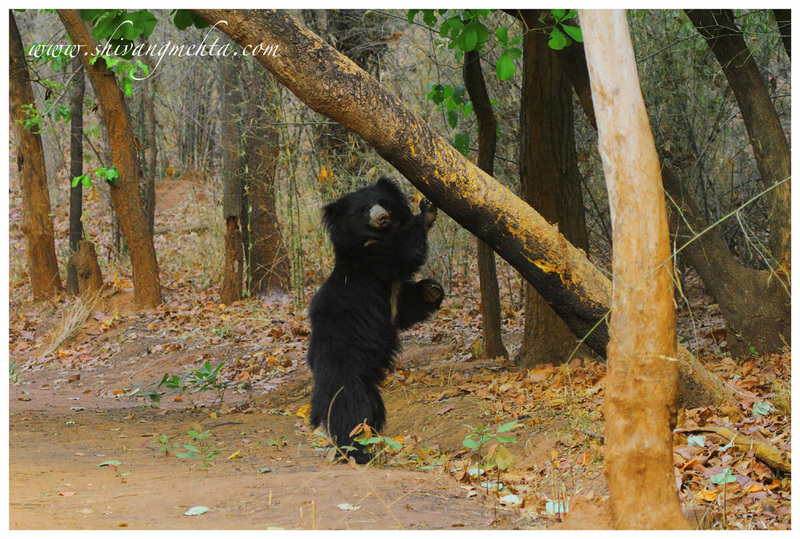 The beautiful looking male sloth bear then climbed the wall inches away from our vehicle and took the comfort of a tree right next to road. He rolled, scratched himself against the hanging bark and spread inside the bamboo thickets. The four minutes of bear action was not the best from a photography perspective but was enough to make up for the last 5 days. Nature is full of mysteries and spectacles that keep unfolding in every corner of wilderness. As children of this planet, the onus is on us to respect natural wonders rather than keep expecting and wishing that nature will fullfil all our demands.